This unusual area resembles the tropics more than Central Texas. Eastern and western species’ ranges merge here. This results in an amazing diversity of plant and animal life. Wildlife frequently seen in the park includes white-tailed deer, armadillos, squirrels, raccoons and numerous birds. Birding: The park is located on the Great Texas Coastal Birding Trail and is a birding "hot spot." Birders have observed more than 240 species of birds in the park. Frequent avian visitors include the crested caracara, prothonotary warbler and red-shouldered hawk. 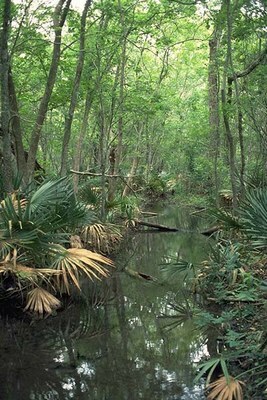 Dwarf palmettos: A stand of dwarf palmetto (Sabal minor) plants, from which the park gets its name, surrounds the park's ephemeral (or short-lived) swamp. These palmettos live in East and Southeast Texas, as well as much of the southeastern United States. Only individuals or small clumps grow to the west and north of this park.